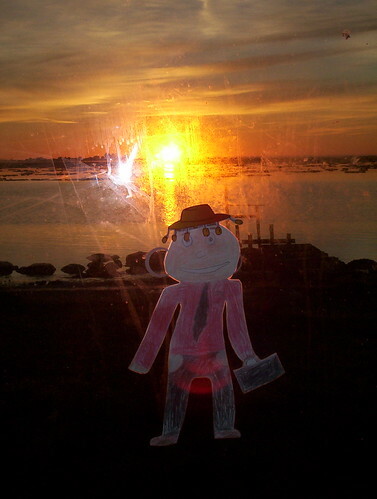 In the book, Flat Stanley, by Jeff Brown, Stanley is squashed flat by a falling bulletin board. One of the many advantages is that Flat Stanley can now visit his friends by travelling in an envelope. 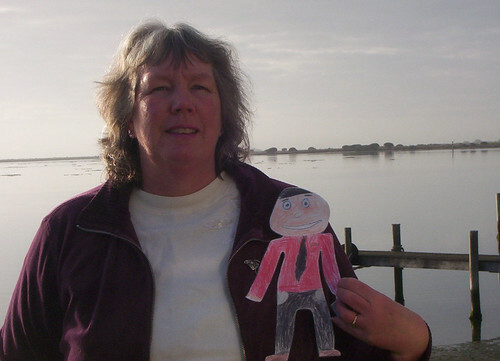 This is the journal for Flat Stanley's visit to Hindmarsh Island in South Australia. Also see who is watching Stanley's adventures via the map on the side bar. G'day mates, I have been with Vicki and Dave for 2 weeks now and I was expecting Vicki to put me in my envelope and post me back home to Trevor soon but Vicki had a surprise for me today. She told me that instead she was sending me to a new home to visit Gaelyne who is her best friend. Gaelyne lives with her husband Rod at Maslin Beach, a suburb of Adelaide, which is the capital city of South Australia. Vicki, Dave and I have had a bonza time while I have been here and I am sad to be going. The last morning I was with Vicki I watched the sunrise. I am excited to be visiting Gaelyne and I asked Vicki how long I would be staying with her. Vicki had another surprise for me. She told me that Gaelyne had just booked a flight to go and visit her children and sisters in the USA. Gaelyne was going to take me home. I live in a regional area of South Australia on Hindmarsh Island.